In this collection, chalcogenide glasses doped with rare earth elements are proposed as particularly attractive materials for applications in integrated photonics. The opening chapter is dedicated to reviewing the studies on optical properties of (GeS2)100−x (Ga2S3)x (x=20, 25 and 33 mol%) glasses, doped with Er2S3 in a wide range from 1.8 to 2.7 mol%, by absorption and photoluminescence (PL) spectroscopy. The authors focus on features in absorption, emission, and local ordering and their derivatives as a function of excitation wavelength, Er3+ doping level, Ga content and temperature for the (GeS2)80 (Ga2S3)20 host composition. Next, to demonstrate the technological importance of optical devices with unique properties derived from rare-earth activated glasses, the authors reviewed some fundamental aspects of rare-earth doped optical glassy devices where the light is confined in different volumes or shapes, namely fibers, monoliths, film/coatings and microspheres. Rare-earth activated glasses are often used as components in integrated optical circuits. Later, optical characteristics of semiconducting crystals with layered structure due to quantization effects in the architecture governed by the atomic arrangements are discussed. 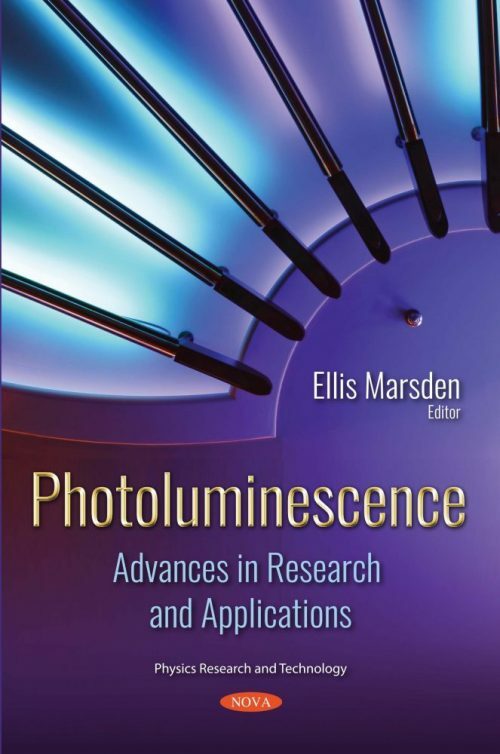 In order to study the microscopic optical processes of these materials, the phenomenological research from photoluminescence studies (PL) was determined to be essential to those established by conventional bulk materials. Layered crystals such as Cs3Bi2I9, BiI3 and PbI2 have been considered for reporting the PL spectra in order to discuss relevant information concerning photo-induced charge carrier separation and also the radiative and non-radiative recombination dependent on deep or shallow trap states. Additionally, the photoluminescence properties of composites based on conjugated polymers and carbon nanoparticles of the type carbon nanotubes, reduced graphene oxide and fullerenes are analyzed. A review is presented on the photoluminescence properties of various macromolecular compounds, for example poly(para-phenylenevinylene), poly(3-hexylthiophene), poly(3,4-ethylenedioxythiophene-co-pyrene), polydiphenylamine and poly(9,9-dioctylfluorenyl-2,7-diyl) as well as effects induced by the carbon nanoparticles mentioned above. The following chapter focusses on fullerenes, carbon nanotubes, graphene, graphene oxide, graphene and carbon quantum dots. Firstly, the general physical and chemical properties of different carbon-based nanomaterials are presented, such as the crystalline structure, morphology and chemical composition. Additionally, the possibilities of application of carbon-based nanomaterials due to its PL properties are analyzed. The concluding chapter focuses on coordination polymers (CPs) / metal-organic frameworks (MOFs) containing metal ions from d and 4f series and a plethora of organic ligands, the resulted compounds showing remarkable photoluminescence properties with different applications in the field light emitting devices (LEDs), biosensors in medical assays, sensors for identifying certain species (molecules, ions) and so on.